Do yu know the only magnolia tree in New York City, only one north of Philadelphia, is right here? And one, there before I was born, in my GA front yard, too. Me siento tan agradecido de que el sur está en todas partes. Hattie Carthan was born in 1901 'with the century' and died 1984, old as pie. Hattie was always a doer, probably born stretching. At 16 she taught school in Zuni, VA population 121, and at 59 was one of the first Black employees of a market research company in Brooklyn. In the 60's in Bed Stuy she threw huge back to school parties for kids in the summer, bought trees with money from pig and chicken roasts. She started a youth corps in 1971 to teach young men how to care for trees. As chairwoman of some 100 associated block associations, she eventually she got 1500 new trees planted in the neighborhood. She saved this Magnolia from getting torn down and hung out with it for years. She turned the three brownstones behind into into an Earth Center that's still there. When gun violence escalated in Bed Stuy as she got old, she didn't move, saying the neighborhood had "already lost too many trees, houses, and people. Your community, you owe something to it. I didn't care to run." Now the community garden at Clifton Place between Marcy and Lafayette avenues in Brooklyn is named after her. You can grow or get farm produce there. Parties on holidays, barbecues in the summer. This tree is an old dude, was a freedom baby. It has survived on Lafayette Ave since William Lemken brought it as a seedling on a ship from North Carolina in 1885, 22 yrs post emancipation proclamation. Its 40ft tall or about 4 and some change Dikembe Mutombo's. In Athens there is a great white oak tree that owns itself. It is like a dot on the map of town is free from people, from time, and it's got all the voodoo of the land and its past on it. Its right there in the exact center of town, of the whole places being, but you wouldn't know it if you didn't know it, there's no reason to drive on that road at all, now. It's a footwork level, intimate-confidential place. 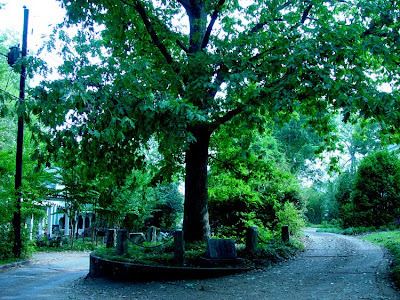 Legend is that William Henry Jackson, son of a Georgia Governor and Congressman, cherished childhood memories of the tree and thought he could protect it best by deeding it ownership of itself and the surrounding land. They say the transaction took place some time between 1820 and 1832. Only one person has ever claimed to have seen Jackson's deed to the tree. Most people acknowledge that it is lost, gone, or never in fact existed. If it did, it wouldn't have any real legal standing. Under common law, the person receiving the property in question must have the legal capacity to receive it and property must be delivered to, and accepted by, a knowing recipient. But the tree is growing, people know its alive, and it stands unchallenged.